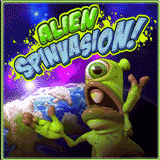 Rival Gaming has just launched it's new space battle slot, Alien Spinvasion. Slots Capital and Desert Nights casinos both introduced the new game today. It features sticky wilds and Rival Gaming’s new Drop Symbols and is now available online for desktop and laptop computers and in the mobile casino for smartphones and tablets. Until March 22nd, the popular casinos will double your deposits and give you a $100 no deposit bonus so you can take the new game for a spin. An eerie green Alien symbol is Alien Spinvasion's sticky wild. The slimy one-eyed space creature remains in position for the next spin, increasing your chances of getting more winning combinations. Three scatters (an Army General) trigger free spins. During free spins, any symbol can become a “drop symbol”. Drop symbols fall from the reels to reveal other symbols. These can give you more winning pay lines. Also spinning on Alien Spinvasion’s five reels are an Alien Egg that’s ready to hatch, a deadly Ray Gun, a Meteor on a collision course, a speeding Rocket and the planet Earth as well as slimy, mutated 9s, 10s, Jacks, Queens, Kings, and Aces. Up to $500 deposit bonus and $100 free no deposit bonus available until March 22, 2017. Available March 14-22, 2017 only. Players from all over the world enjoy a huge selection of online casino games at Slots Capital Casino and Desert Nights Casino.